SAPULPA, Okla. (May 5)--This weekend promises to be exciting for the stars of the Casey's General Stores USMTS with a trio of events at places not familiar to the majority of the series regulars. 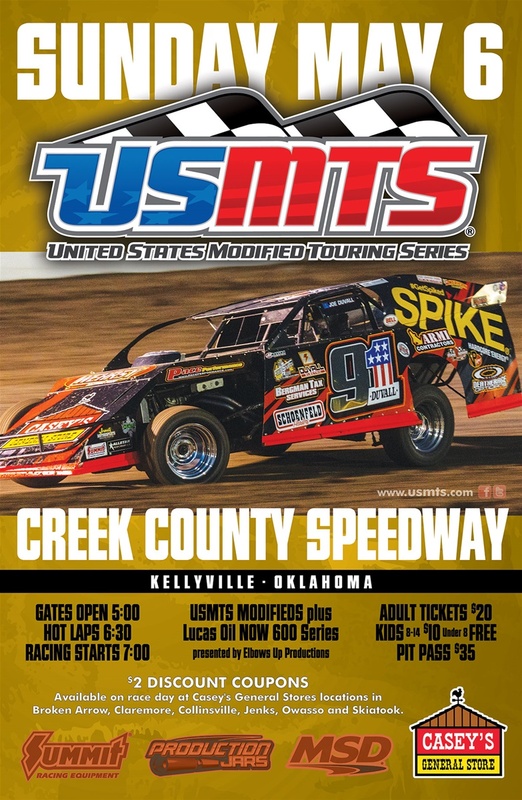 The Creek County Speedway will play host to the USMTS for the first time on Sunday, and the bullring that's been delivering high-octane excitement to fans in the Tulsa, Okla., area since 1986 will see the stars and cars of the biggest modified series on the planet invade the 1/4-mile dirt oval with some serious coin dangling in front of them. Further making the stop interesting is the promotional debut by Claremore, Oklahoma's Joe Duvall. "Big Daddy" is a partner for the event and it has allowed him to dip his toes into the business of racing on the opposite side of the fence than he is accustomed to. 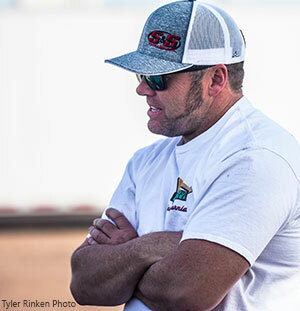 "It started over the winter when Bryan Hulbert and I were talking about racing and he said 'USMTS should run at Creek County' and it kind of put my wheels in motion." "I talked to Steve Hahn, Emmett's son, and he talked to Emmett and they were all for it. We just had to agree on a date that worked for them and the USMTS too." Businessman and racer Shannon Scott is pitching in as the event's presenting sponsor with his Henryetta Ford dealership in Henryetta, Okla.
"There's no other place to go buy your Ford vehicles, plain and simple," said Duvall, a long-time customer. "Shannon makes the buying process so easy and there is zero hassle to get a deal done. He's also different from those big city dealers because he doesn't have any of those b.s. fees that a lot of places try to slide through and get away with. He's just a regular guy like the rest of us, and has made a hell of commitment to the sport we love. I couldn't be any more proud to have his brand behind our event." There's a lot that is sentimental to Duvall about Sunday's event. "I started racing at Creek County in 1986 in cars and on motorcycles. With my current schedule I don't get to race around home very often so I'm really looking forward to this. We're in the entertainment business and I'm excited to help put on a show for all the great fans." With more than $4,000 just in lap leader money, even more for the hard charger of the race, tons of contingency sponsors, an increased purse for the support class and, of course, one-of-a-kind trophies awarded by good ol' fashioned trophy girls, you'd be out of your mind to miss this event. * $500 hard charger award courtesy of Bergman Tax & Accounting. * $100 to highest finishing Chevrolet Performance crate engine courtesy of CAM Chassis. * Carbon fiber driveshaft to 10th place finisher courtesy of Fast Shafts. * Four (4) springs to 15th place finisher courtesy of Swift Springs. * $100 off full wrap to 5th place finisher courtesy of five1seven Designs. 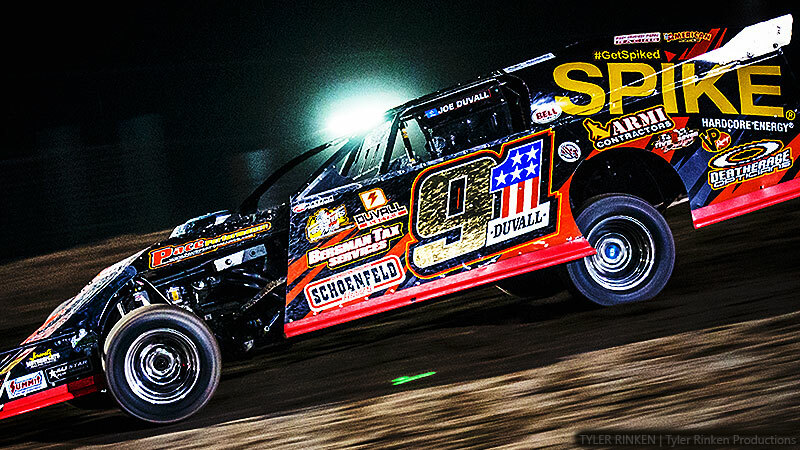 * $100 off Tri-Y headers to 20th place finisher courtesy of Schoenfeld Headers. * $50 certificate to first non-qualifier from each "B" Main courtesy of Wehrs Machine & Racing Products. * $50 certificate to all non-qualifiers courtesy of Velocita-USA. * $50 certificates to six (6) mystery positions in the "B" Mains courtesy of Speedway Motors. * $50 certificates to all USMTS and NOW600 competitors courtesy of RacerWebsite.com. * $500 credit to 12th0inh and 17th0inh place courtesy of Muskogee Powdercoat. * 3' x 4' custom drivers mat to leader on lap 27 courtesy of Bulletproof Tees. * Awards to mystery "B" Main non-transfer positions courtesy of Brassmonkey Racing Products. * Case of Spike Energy drink to all "B" Main winners.